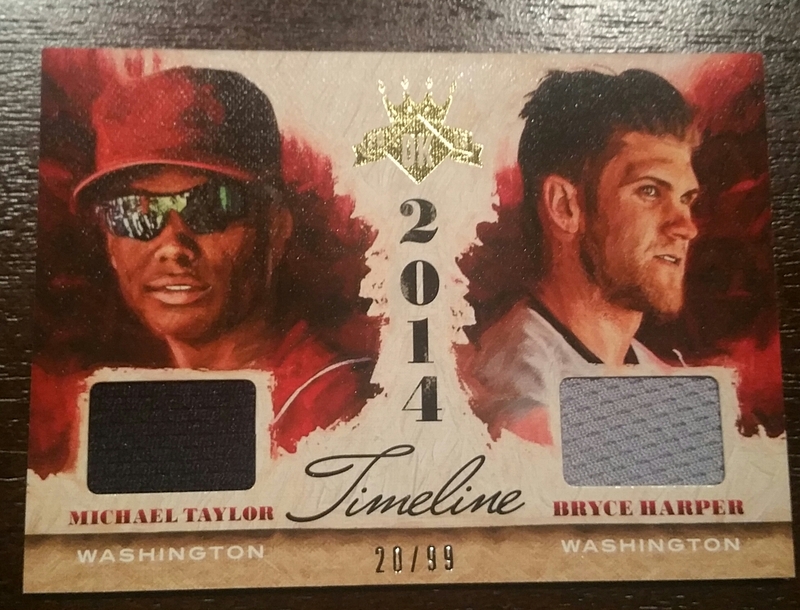 This sweet relic came in a trade with Tracy. 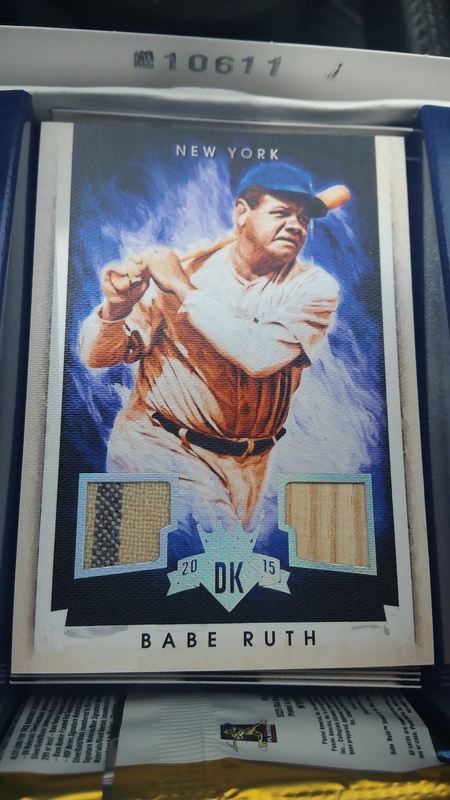 A “rookie” year huge relic from the crew at Panini. 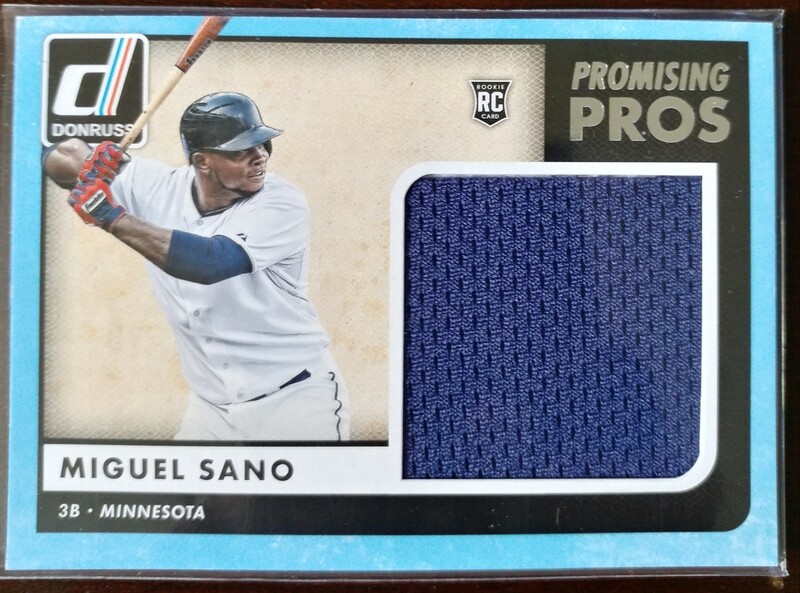 This is far from my first Miguel Sano relic/auto, but the first relic without an auto included. Woot. 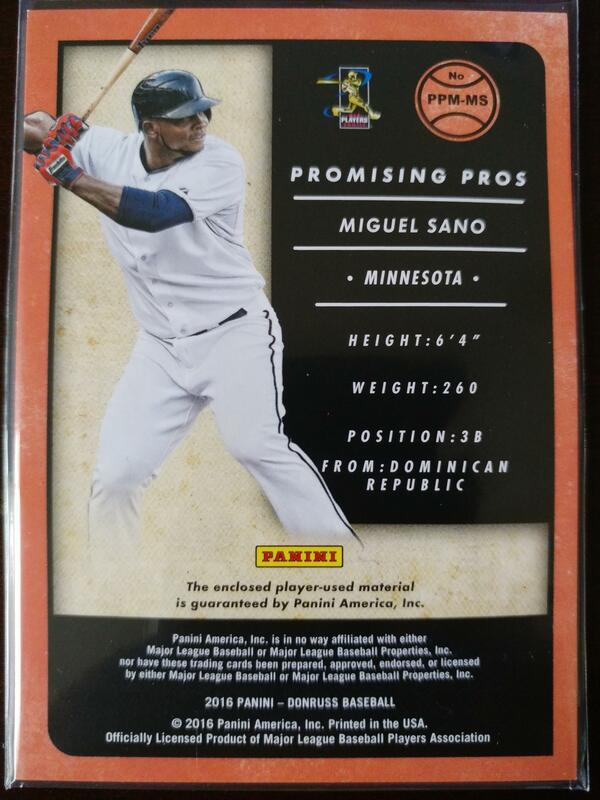 I believe these ‘Promising Pros’ relics were more common in retail than hobby. Despite being injured at the moment, the 2017 All-Star has 54 doubles, 71 home runs, and 195 RBIs in 307 career games. That works out to a 162 game average of 28 doubles, 37 home runs, and 103 RBI. The star shines bright on the future. :). 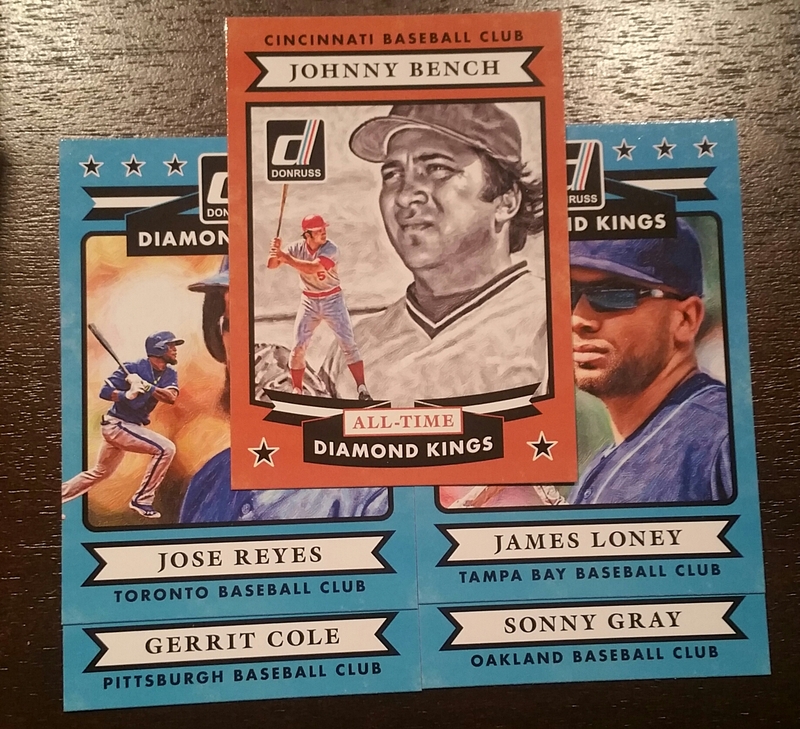 I’ve given a few box breaks of Diamond Kings and Perennial Draft Picks in the past, so instead of rehashing that, here’s the highlights of a recent break during a card show. The show continued on Sunday, but being Mother’s Day, let’s just say my presence was required in more important places. 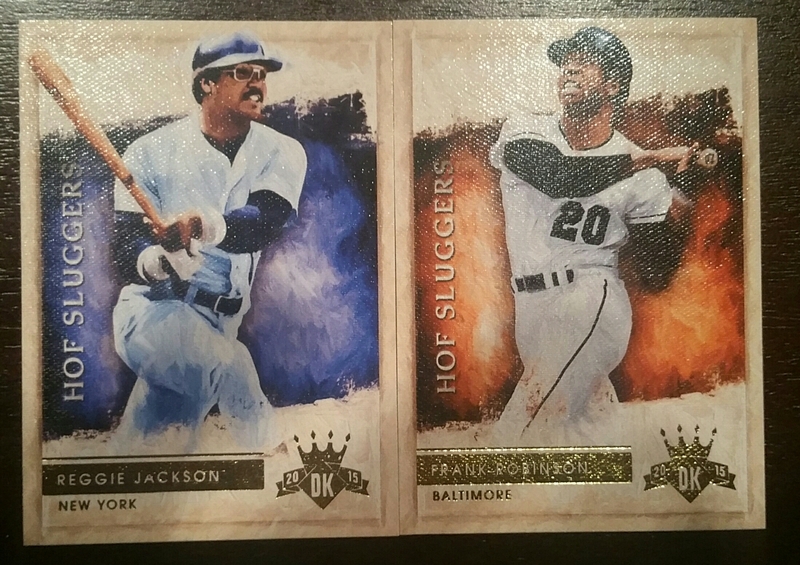 Box one – another 2015 Diamond Kings. Sure I can’t strike gold every time I break a box, but you can’t make contact without swinging the bat! 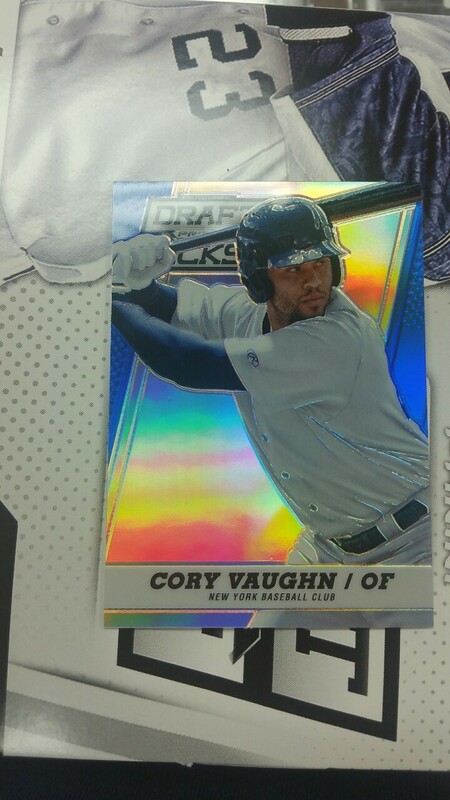 Plus I pulled a Twins hit! How often does that happen? Three short-prints, but 0 #/d cards. :(. Worse still, two of the short prints were the same player. :(. 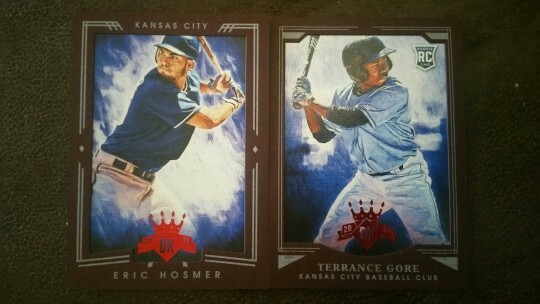 Two framed Diamond Kings – #45 Eric Hosmer, #181 Terrance Gore. 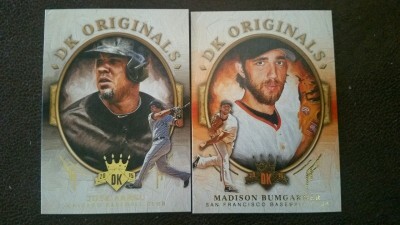 Two DK Originals – #6 Madison Bumgardner, #8 Jose Abreu. 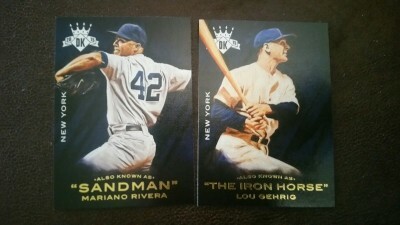 Two Nicknames – #3 Mariano Rivera, #5 Lou Gehrig. 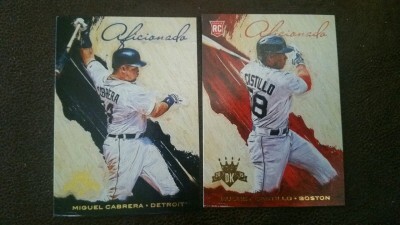 Two Aficionados – #14 Rusney Castillo, #16 Miguel Cabrera. 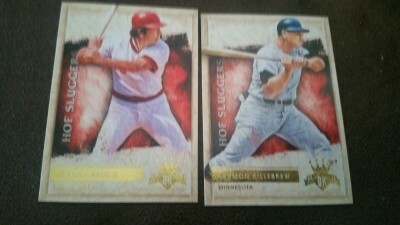 Two HOF Sluggers – #3 Harmon Killebrew, #18 Johnny Bench. 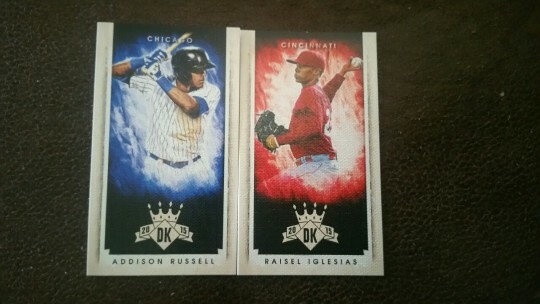 Two minis – #202 Addison Russell, #238 Raisel Iglesias. 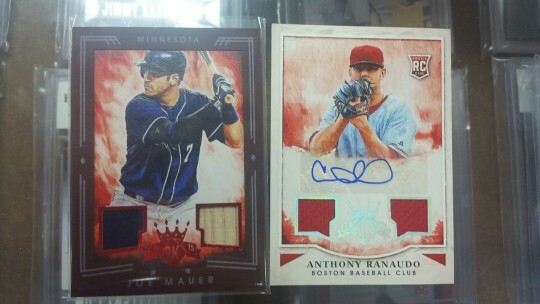 #082/299 Anthony Ranaudo dual relic, auto, and a #48/99 Joe Mauer bat, jersey relic! With the lottery ticket out of the way, I broke three more cheap boxes of Perennial Draft Picks. A big spender saw the players I was pulling and decided to break a few himself. More on that later. Box two Base – 103. 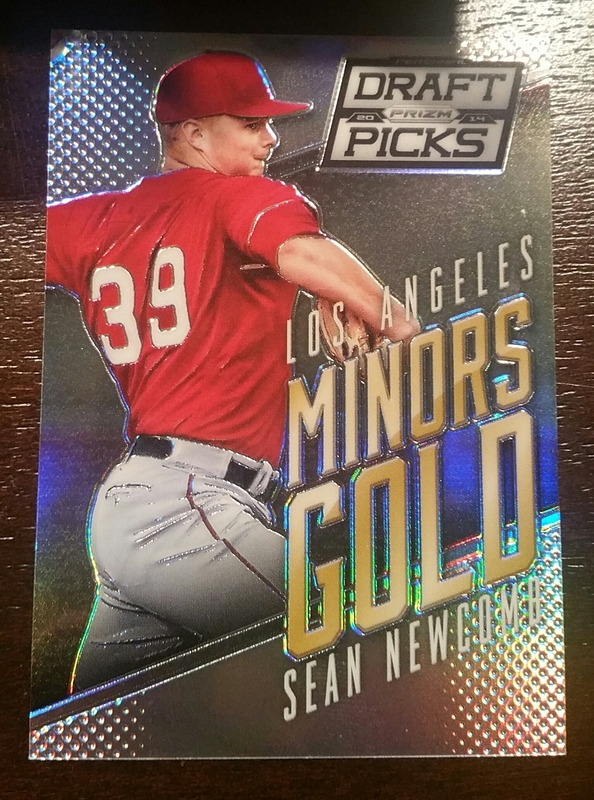 2 Minors Gold – #2 Kaleb Cowart, #17 Dylan Bundy …..
1 Minors Gold – #2 Kaleb Cowart…..
1 Prizm #/d – Stat Leaders #3 Joey Gallo #11/20. 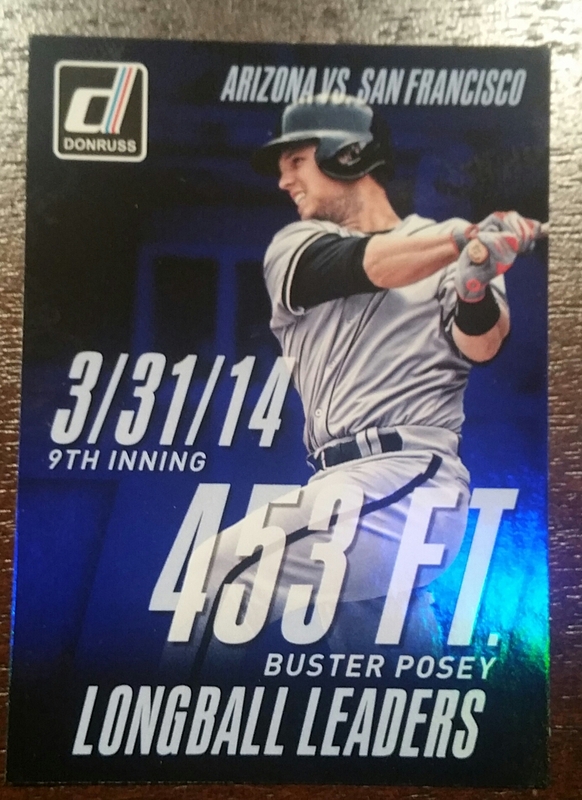 Not a bad #/d card! 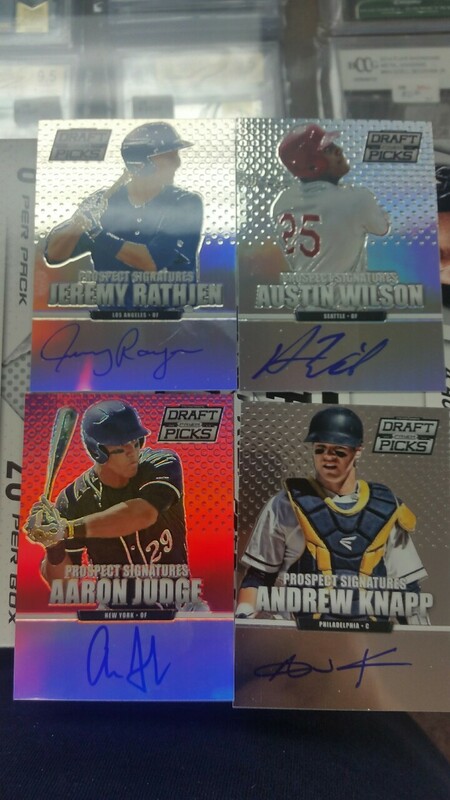 Jeremy Rathien, Austin Wilson, Andrew Knapp, Aaron Judge #42/100 red prizm. 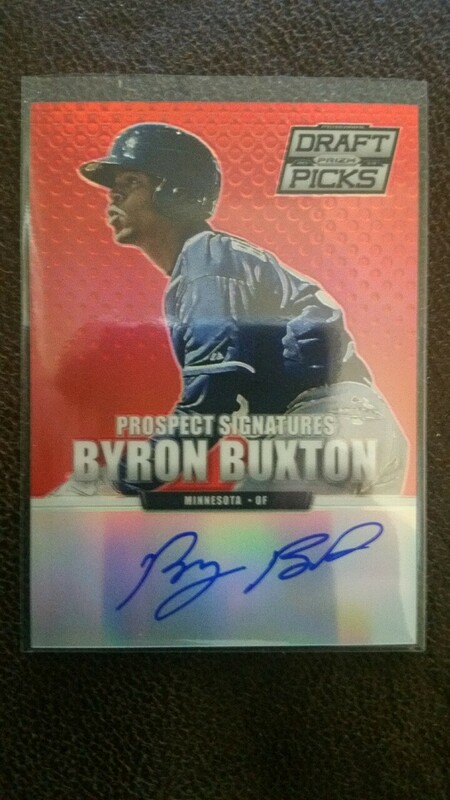 2 Minors Gold – #5 Byron Buxton, #18 Kris Bryant – How’s about that? 4 Autographs #70 Alex Yarbrough, #77 Anthony DeSclafani prizm, #86 Chris Taylor prizm, #96 Austin Kubitza prizm. 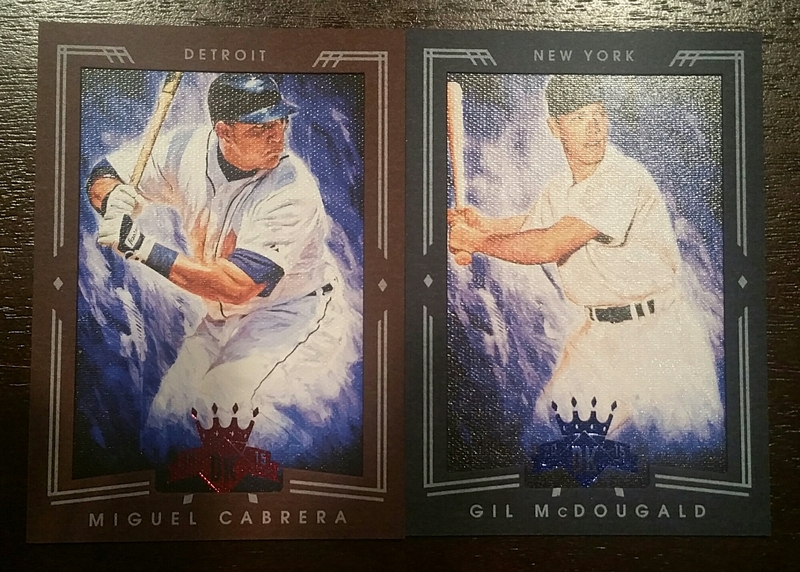 Two retail parallels, a home and state parallel, and a #181/199 Chrome. If these are the types of shows Duane is gonna run, count me in for future shows! No, not related to my shoulder – that’s remaining well medicated for now… but without a show until nearly the middle of May, there’s not much to look forward to, so the local card shops have gotten plenty of our money. 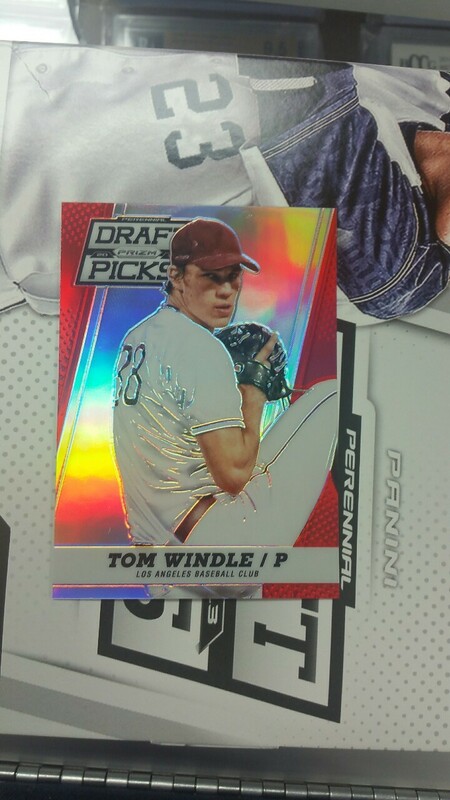 Most recently we bought four more boxes of 2013 Panini Perennial Draft Picks. I’ll highlight each below. 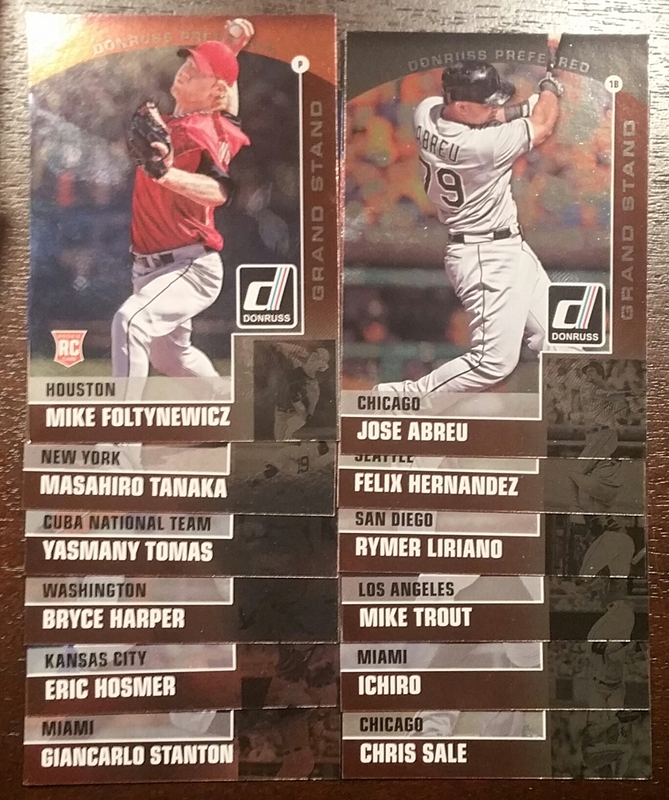 Box 1 definitely had the best value I think, with this Carlos Correa #/d to 100 insert. 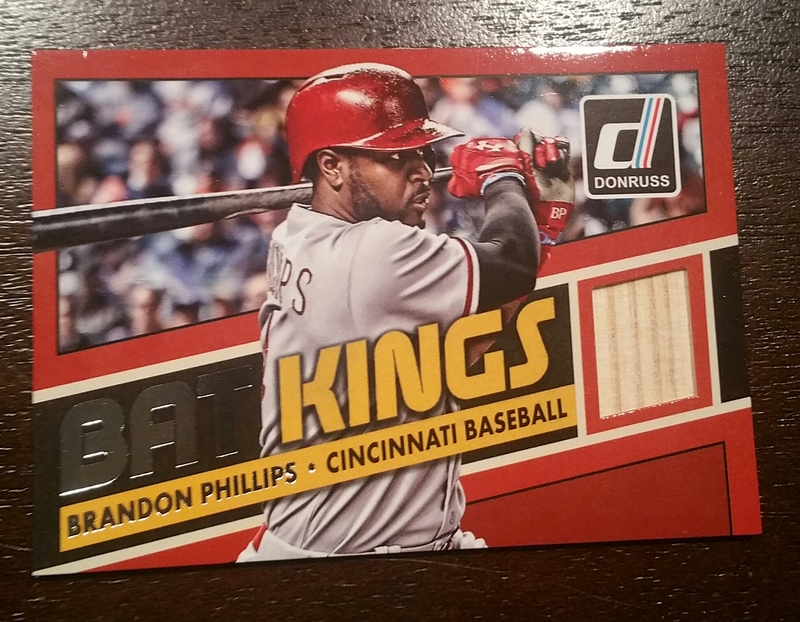 Shame it was the first pack of the break… :/. Base – 102 including Maikel Franco(Philadelphia), 2x Kaleb Cowart(Los Angeles AL), Rock Shoulders(Chicago AL), Archie Bradley(Arizona), Mookie Betts(Boston), Kyle Zimmer(Kansas City), Gregory Polanco(Pittsburgh), Carlos Correa(Houston), Joey Gallo(Texas), 2x Jose Abreu(Chicago AL/Cuba National Team). Enough Tom Murphy cards!!! #ThanksPanini. 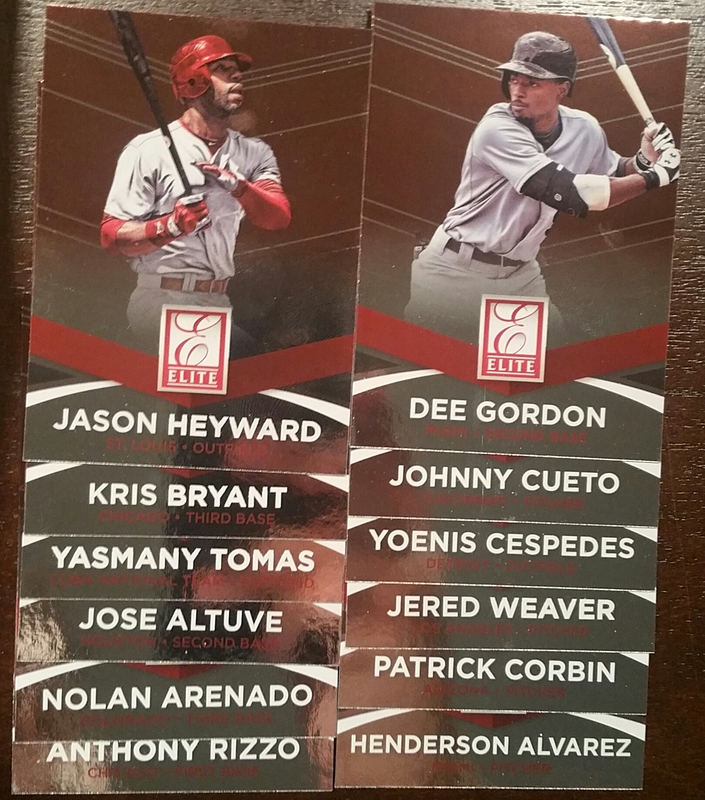 Prizm #/d – 1 Base(Carlos Correa!, Houston #/050/100). 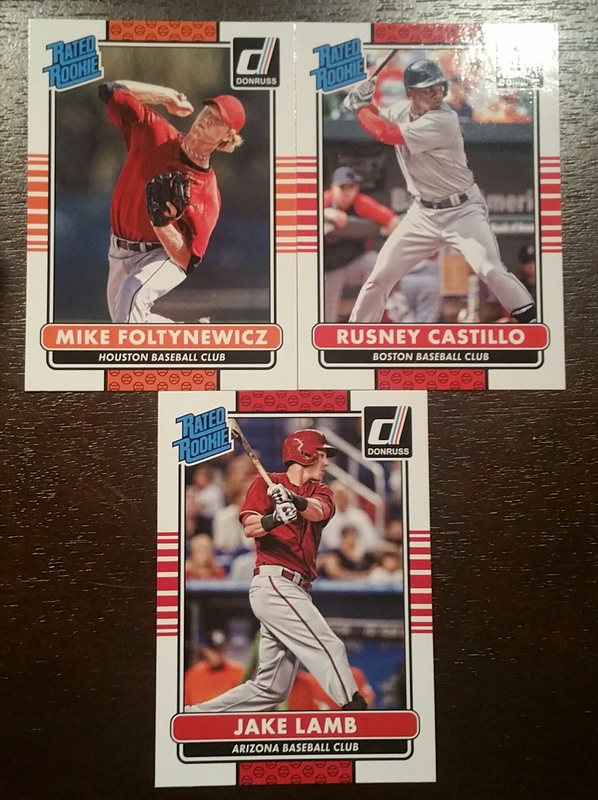 Autographs – Rosell Herrera, Colorado; Miguel Almonte, Kansas City, #/75 blue prizm redemption; Kaleb Cowart, Los Angeles AL, Prizm; Austin Wilson, Seattle, #020/100 red prizm. 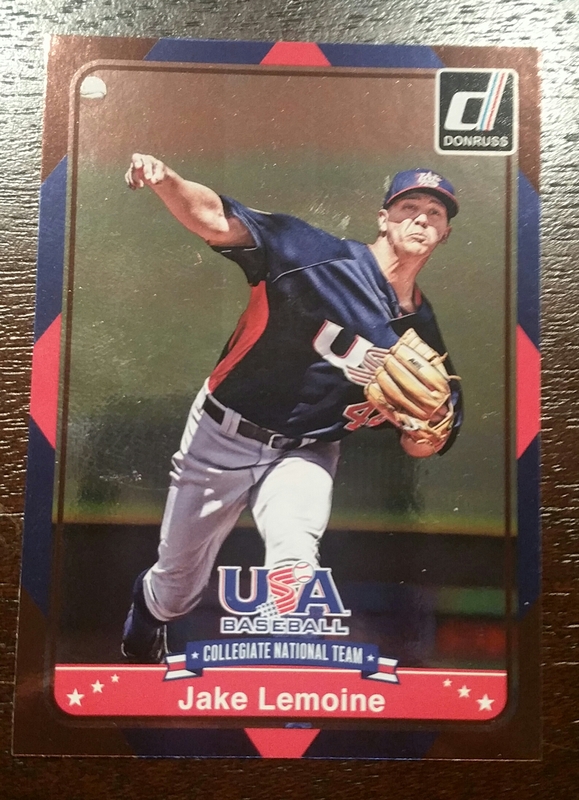 Twins – 1 Minors Gold insert(Kohl Stewart), 5 Base(D.J. Baxendale, Stuart Turner, 2x Stephen Gonsalves, Brian Navarreto). Box 2 was pretty average. Nothing overly special, relatively weak prizm and #/d group, and a headache with the Mike/Michael O’Neill autos in the same box. Even the backs of the cards mention the confusion. Base – 103 including Carlos Correa, Joey Gallo, Archie Bradley, Maikel Franco, Kaleb Cowart(Los Angeles AL), Jose Abreu(Chicago AL/Cuba National Team), Gregory Polanco, 2x Rock Shoulders(Chicago NL), Kyle Zimmer amongst others. 4 2013 Draft Class(Kohl Stewart, Minnesota; Dominic Smith, New York NL; Eric Jagielo, New York AL; Aaron Judge, New York AL). 1 2013 Draft Class(Chris Anderson, Los Angeles NL). Gallo probably the best of the bunch, but that’s not too saying much. Prizm #/d – 1 Base(Micah Johnson, Chicago AL #14/75). Autographs – Dixon Machado, Detroit Prizm; Hunter Dozier, Kansas City Prizm; Michael O’Neill, New York AL; Mike O’Neill, St. Louis, #024/100. If you’re curious – it’s Michael O’Neill that’s related to Paul(his son). 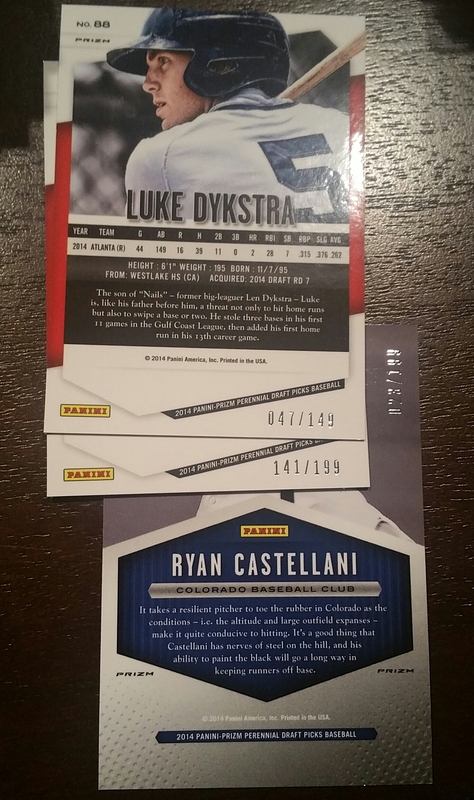 Twins – 4 Base(Ryan Walker, 2x Brian Navarreto, D.J. Baxendale, Stuart Turner, D.J. 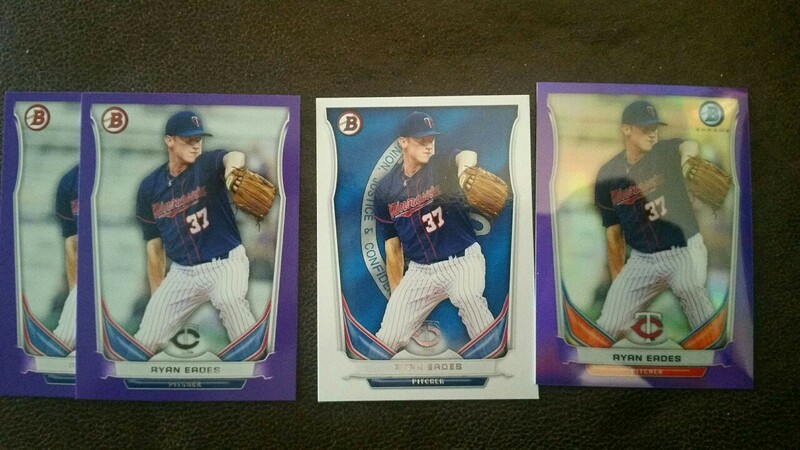 Baxendale, Stephen Gonsalves), 1 2013 Draft Class – Kohl Stewart. I think that’s a team set in one box. Very nice. :). Box 3 A few inserts of players I’ve heard of, good base collation, but weak signature grouping. Also, another Kaleb Cowart. :/. 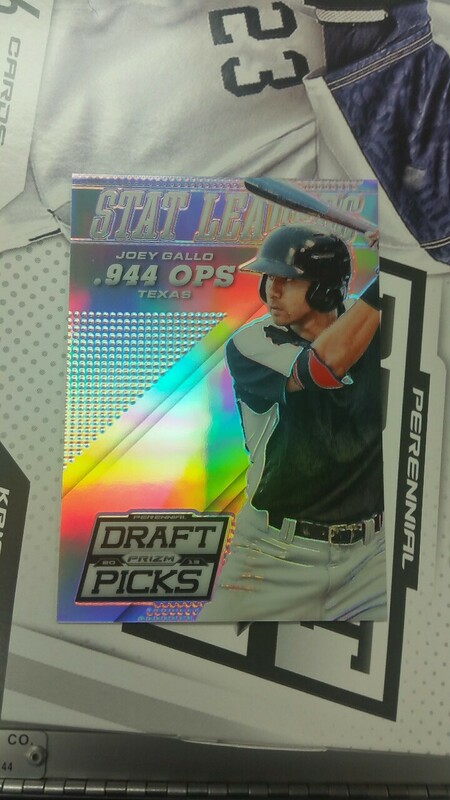 Base – 103 including Carlos Correa(Houston), Joey Gallo(Texas), Archie Bradley(Arizona), Maikel Franco(Philadelphia), Gregory Polanco(Pittsburgh), Rock Shoulders(Chicago NL), 2x Kyle Zimmer(Kansas City) amongst others. 4 2013 Draft Class(Kohl Stewart, Minnesota; Dominic Smith, New York NL; Eric Jagielo, New York AL; Aaron Judge, New York AL). The last of which were exact duplicates of Box 2. #ThanksCollation. 1 Draft Hits(Chase DeJong, Toronto). 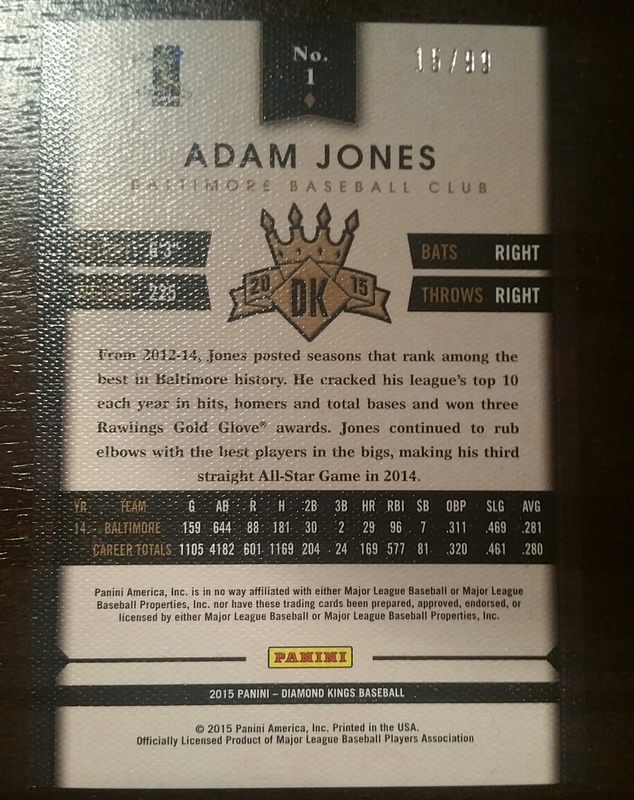 Prizm #/d – 1 All America Team Austin Meadows, Pittsburgh, #3/10. 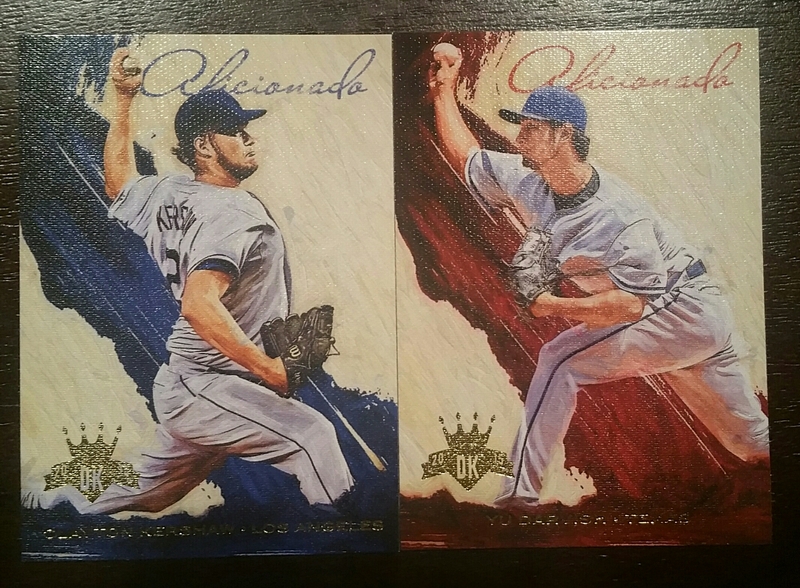 Autographs – Luis Torrens redemption(who? New York AL), Austin Wilson(Seattle) Prizm, Kaleb Cowart(Los Angeles AL) Prizm, Eric Jagielo(New York AL). Twins – 4 Base(Ryan Walker, Brian Navarreto, D.J. Baxendale, Stuart Turner), 1 2013 Draft Class – Kohl Stewart. Box 4 probably has the best mix of the bunch all things considered. Tons of #/d and prizm cards, two nice low #/d autos, and a good mix of prospects. 4 2013 Draft Class(D.J. Peterson, Seattle; Ian Clarkin, New York AL; Michael Lorenzen, Cincinnatti; Sean Manaea, Kansas City). 1 2013 Draft Class(Riley Unroe, Tampa Bay). 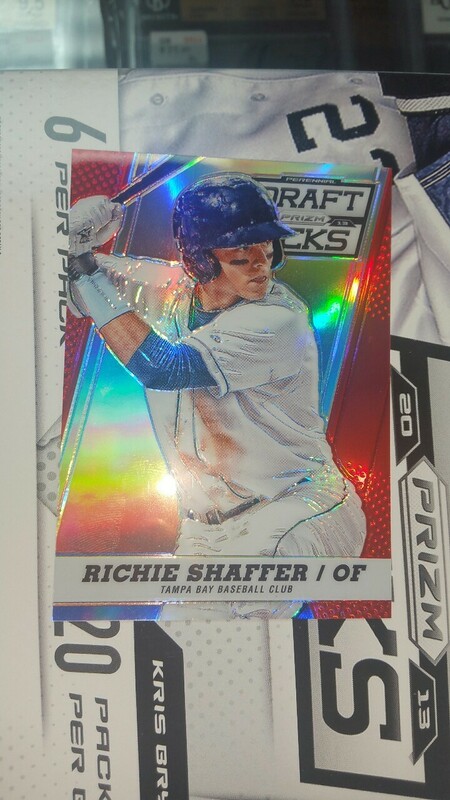 Prizm #/d – 3 Total. 1 First Overall Picks 1967(Ron Blomberg New York AL, 15/20). 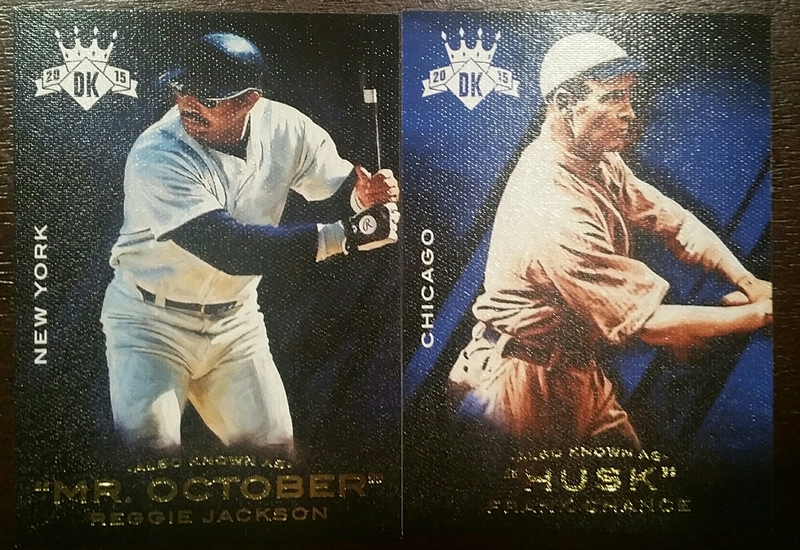 I nearly missed the last two as they look like a regular insert. I hadn’t seen either however so that tipped me off that they might be numbered – checking the back confirmed as such. 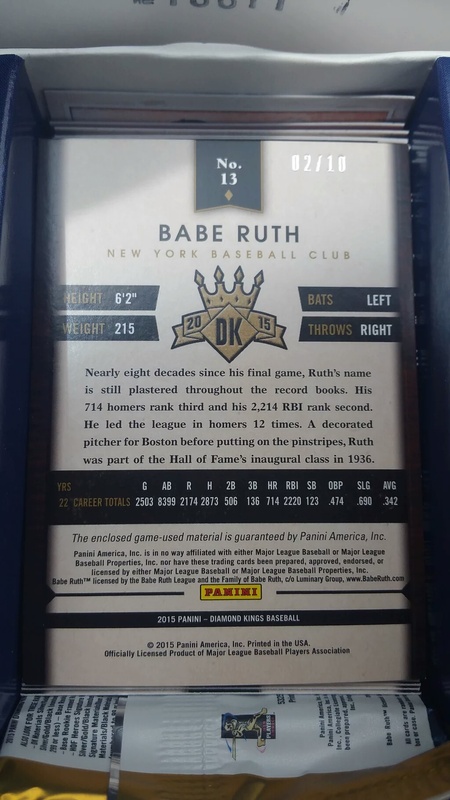 I absolutely dislike(but respect) the evil empire so all of the Yankees cards is a big minus for this box. Autographs – Roberto Osuna(Toronto), #84/100; Marco Gonzalez(St. Louis), #002/100; Cory Vaughn(New York NL); Micah Johnson(Chicago AL). Twins – 5 Base(Ryan Walker, Brian Navarreto, D.J. Baxendale, Stephen Gonsalves, Stuart Turner). 2015 Puh-Knee-Knee Perennial Draft Picks and Prospects. Or Panini if you’re not myself or @eyedinh. 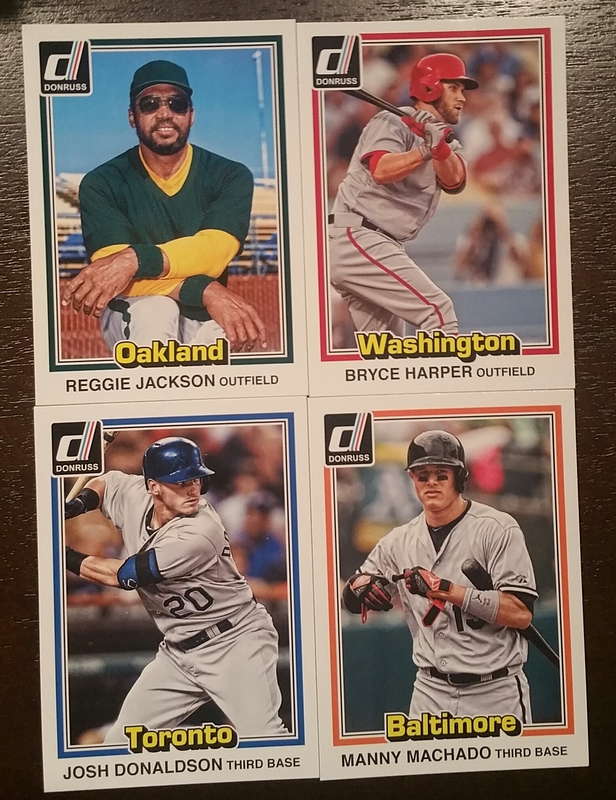 Here’s a fun set with soon to be stars – Panini’s Perennial Draft Picks/Prospects. Consisting of just drafted players, and prospects in the minors, this set is an attempt to attract the prospector types into buying other products than Bowman base/chrome/draft. We’re mostly concerned with vintage cards and current roster guys, so a lot of these players are big “Who’s this?” responses, but it’s still a fun break. Especially when on fire sale for under 40$. 29 prospects with 1 Twin. 20 2014 Draft Class base including 1 Twin. 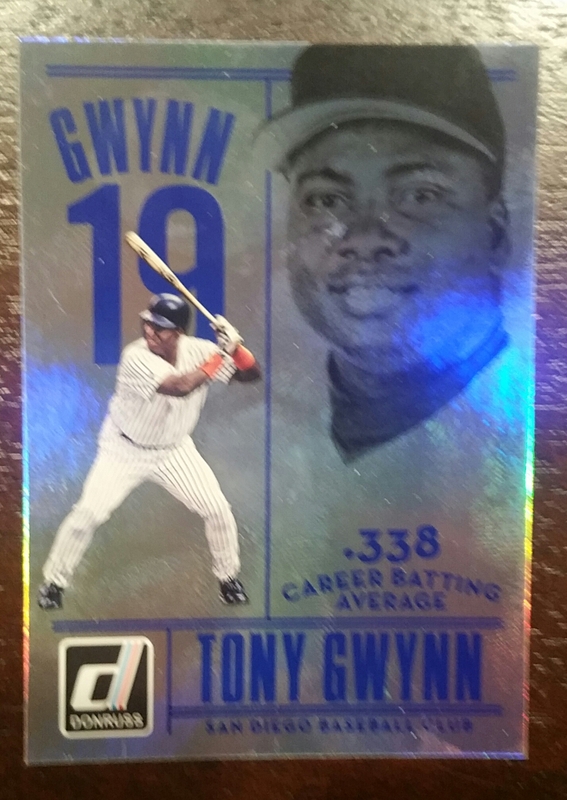 1 Insert – Minors Gold Prizm. 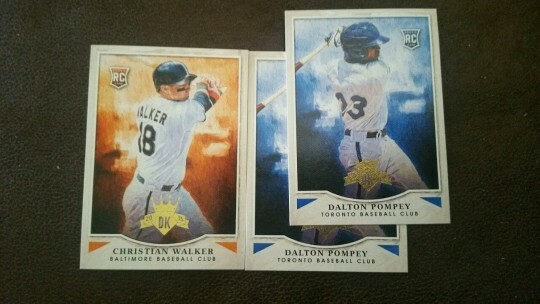 4 Prizm – 2 Prospects base, 2 2014 Draft Class base. 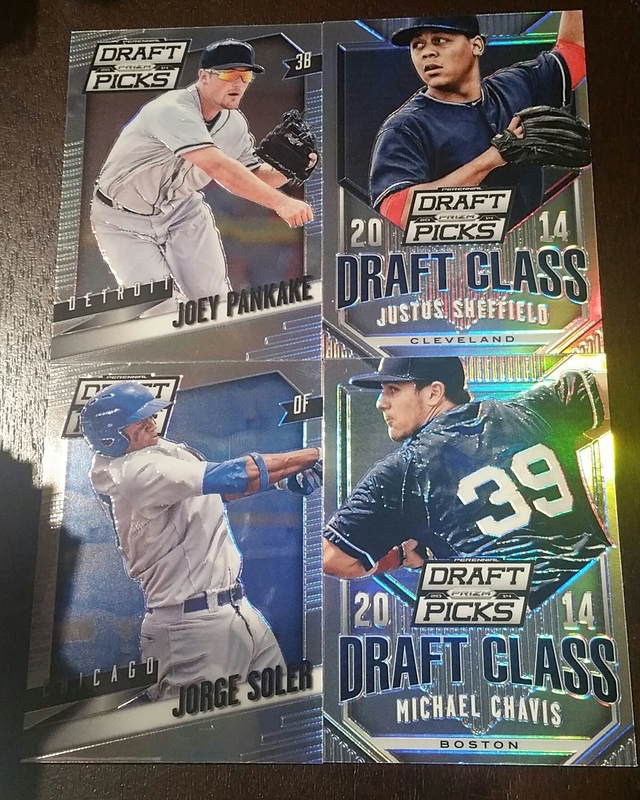 3 #/d Prizm cards 1 prospect, 2 2014 Draft Class. 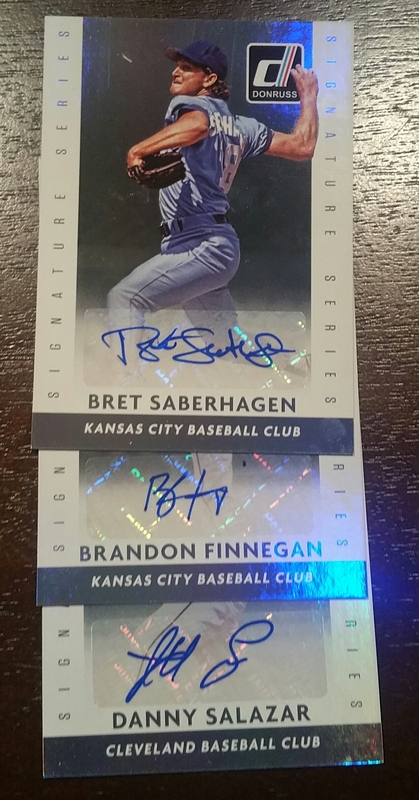 3 #/d Auto cards two #/149, one #/100. Twin count: 2. :(. Most cards for trade, check the checklists and make an offer. :). Up next: the big kahuna! Stick around folks, same time, same bat channel. Or something like that. 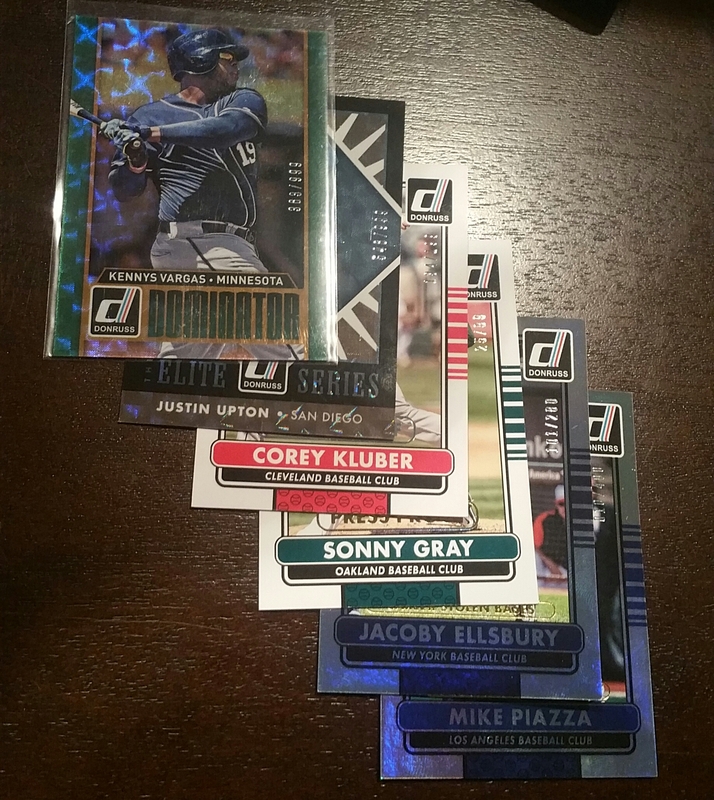 :D.
Mike Piazza #/400, Jacoby Ellsbury #/280, Sonny Gray #/99, Corey Kluber #/199, Justin Upton #/999, Kennys Vargas #/999. 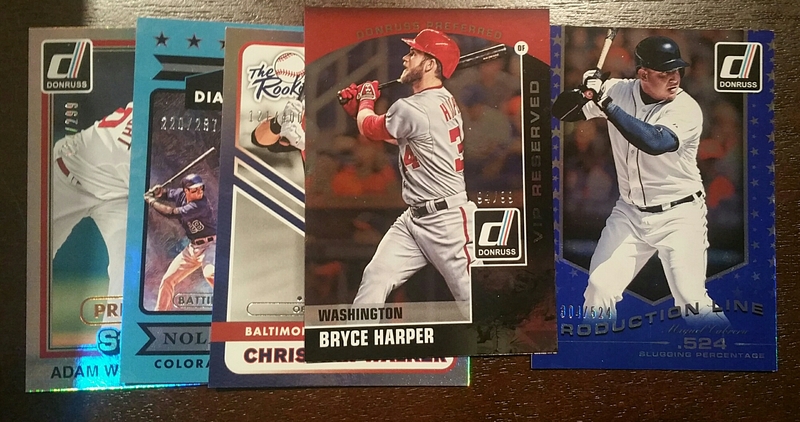 Miguel Cabrera #/524, Adam Wainwright #/299, Nolan Arenado #/287, Christian Walker #/400, Bryce Harper #/99. 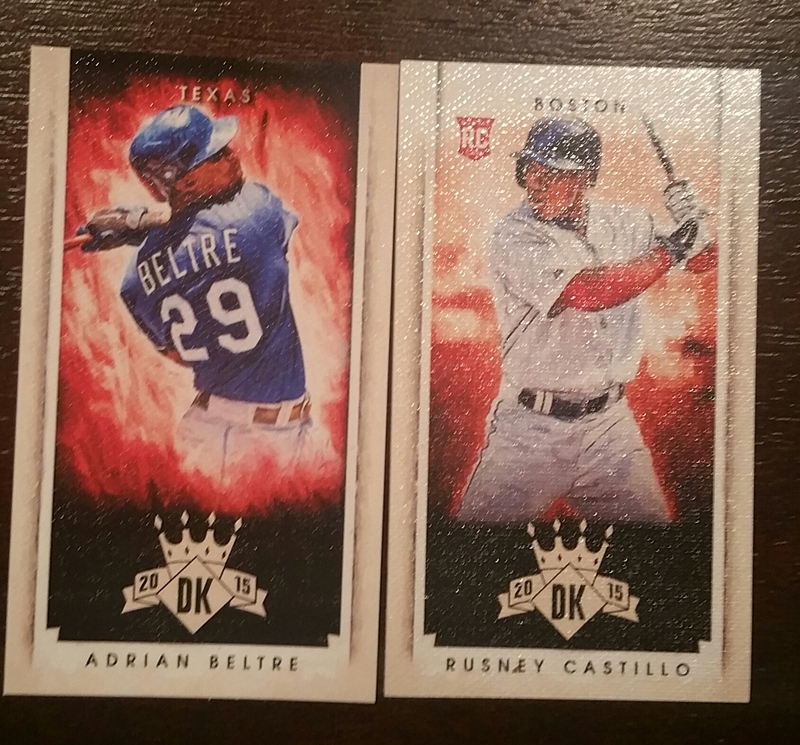 Overall, not a bad break. 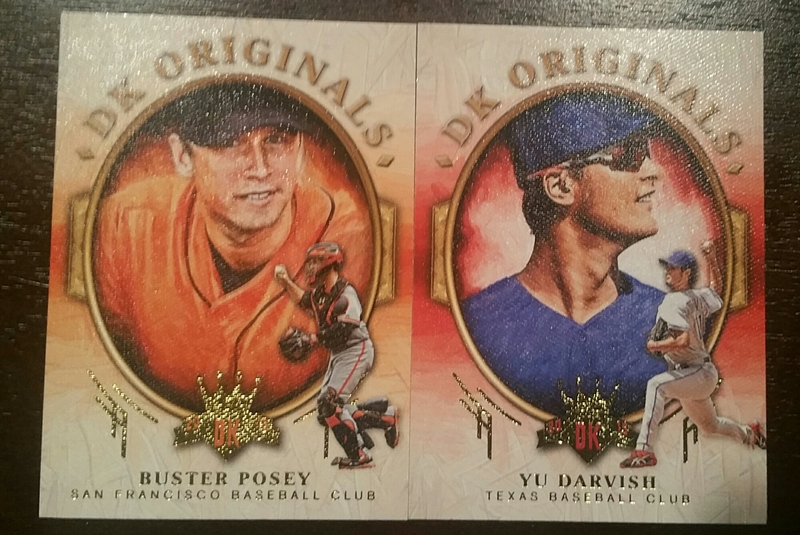 I loved some of the inserts, especially the Heritage-like using of older designs, and naturally the Kennys Vargas #/d. If you don’t mind not having logos and team names, this is definitely a low end must purchase. Up Next: Panini Perennial Draft Picks/Prospects, box #3 of the day.